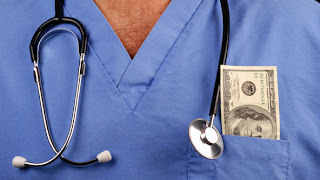 A report by the International Federation of Health Plans (IFHP), a group of more than 100 member health insurance companies in 25 countries, found that the U.S. pay significantly more for every category of basic healthcare services relative to any other first-world country. The report analyzed the prices of 12 countries. "In the U.S. prices, we have a very wide range and the range is stunning,” said George Halverson, chairman and CEO of Kaiser Permanente, and a member of the IFHP board. "It means, to us, that apparently the difference in the cost of healthcare is not so much about utilization," said Tom Sackville, CEO of the IFHP. "They seem to be more about the actual unit cost of items of care." The report found the price of a U.S. Cesarean section in 2012 was $10,500-$26,000, while the next highest was Australia at about $10,000, with the least expensive county Argentina at $1,500. A routine office visit of a U.S. physician cost $68-$178, compared with $30 in Canada, $25 in South Africa and $10 in Argentina. One day in the hospital cost U.S. private insurers $4,287, on average, compared with $1,472 for private Australian insurers, the next closest country in price. Meanwhile, public and private insurers in Argentina paid $429 a day, and a private insurer in Spain paid $476, the report said. Healthcare prices for Canada, New Zealand, Switzerland and the United Kingdom were paid from the public sector and one health plan in each country, while prices for Australia, Chile, the Netherlands, Spain and South Africa were from the private sector and represent prices paid by one private health plan in each country. Prices for France and Argentina were a blend of public and private sector with the data provided by one health plan in each country. U.S. prices were calculated from a database of more than 100 million paid claims that reflect prices negotiated between thousands of providers and almost 100 hundred health plans. On Wednesday, February 6, when Health Affairs held a briefing to discuss its February 2013 issue, "New Era Of Patient Engagement." In February's thematic issue of Health Affairs, authors from across the healthcare and policy spectrum explored the evidence on patient engagement; the challenges in changing the behavior of patients and providers; and the opportunities that exist to enhance patient engagement and activation in a transformed healthcare system. The briefing included some wonderful panels which can be view on the Health Affairs website. Two of the speakers that day were Lygeia Ricciardi and Jessie Gruman. I read both articles (strange that An Accidental Tourist Finds Her Way In The Dangerous Land Of Serious Illness is open access while A National Action Plan To Support Consumer Engagement Via E-Health requires a subscription). The videos below from the briefing highlight the talks of Lygeia and Jessie. Lygiea points out how health IT and mobile technologies have created ideal conditions for the growth of patient engagement technologies. 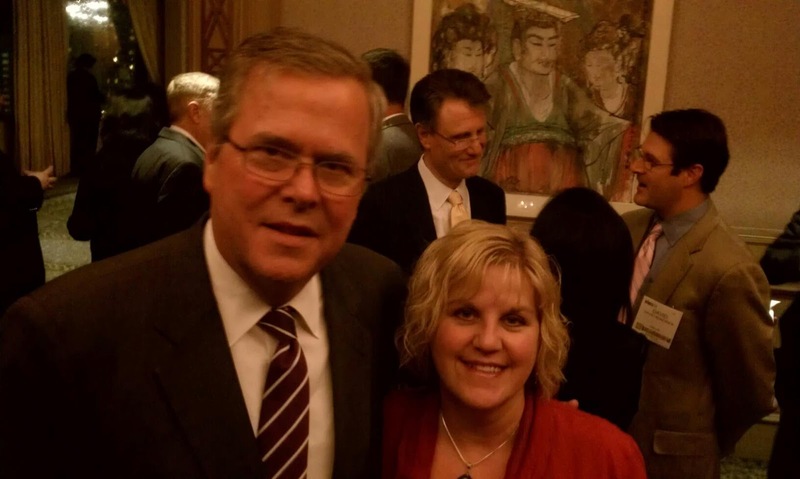 Jessie gives an overview of her compelling personal story and battle with cancer. She discusses how patient engagement is necessary to make the best use of care that is available to us. The House Energy and Commerce Subcommittee on Communications and Technology, chaired by Rep. Greg Walden (R-OR), Tuesday kicked off the “Health Information Technologies” hearing series to discuss the critical role of technology in the health care industry and how federal regulations and taxes could impact patients, hinder innovation, and increase costs for consumers. In July 2011, the FDA proposed regulating mobile medical apps. In early March, committee leaders wrote to FDA Commissioner Margaret Hamburg seeking more information on possible FDA regulation of smartphones, tablets, and mobile apps through Obamacare's medical device tax, which could harm the innovation and economic benefits of the U.S. mobile marketplace. While protecting patient safety is a universal objective, innovators today expressed concern regarding the FDA’s failure to finalize the rule, the effects that overbroad application of the arduous medical device approval process would have on the ever-changing mobile app marketplace, and the deterrent to investment that would result from applying the medical device tax created by the president’s health care law. Despite claims from some Democrats that the ground rules for FDA regulation of mobile health applications are clear and that there is no risk applications, smartphones, or tablets will be taxed, all six of the witnesses said the situation is murky at best. At the conclusion of the hearing, Rep. Renee Ellmers (R-NC) asked each witness if they could rule out the possibility that the medical device tax would hamper innovation and all six said they could not. Watch the exchange here. On Wednesday, the Subcommittee on Health continued the hearing series with a look at “How Innovation Benefits Patients.” Members today focused on how innovative medical technologies can benefit American patients and discussed what steps need to be taken to foster innovation and growth. Providers and patient groups elaborated on how these technologies benefit patients and the impact FDA regulations would have on these medical advancements. In July 2011, the Food and Drug Administration proposed regulating medical applications. This month, committee leaders wrote to FDA Commissioner Margaret Hamburg seeking more information on whether FDA intends to regulate smartphones, tablets, and mobile apps and whether it would be trigger the 2.3 percent medical device tax included in the president’s health care law. Joseph Smith, Chief Medical and Chief Science Officer for the West Health Institute, testified before the subcommittee that the healthcare industry's innovation and experimentation requires a "clear, consistent and timely approach" to regulation. "It is an open question whether the existing medical device regulatory framework can be sufficiently modified to provide the applicability, clarity, predictability and timeliness required," Smith told lawmakers. "The FDA's draft guidance on mobile medical apps offered some improved clarity but still described significant areas of regulatory discretion, and now after lengthy delay without becoming finalized, has left an industry in limbo." Dr. Farzad Mostashari, National Coordinator of Health Information Technology, gave testimony saying, "To truly transform delivery, health care providers must also redesign and reengineer workflow of care. This does not happen overnight. Health IT holds tremendous promise for delivering “smart health” to patients right at their fingertips to help all of us achieve the best possible outcome for each individual. We must carefully balance the need for the widest innovation possible, with protection of patient privacy, security, and safety." Dr. Mostashari stated that one of the challenges encountered in adoption and improvement of Health IT has been the lack of interoperability between individual Health IT systems, as well as between Health IT systems and medical devices. 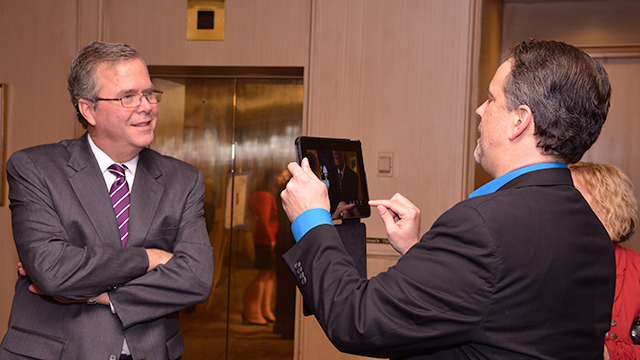 He explained that improvements in interoperability would greatly advance use of Health IT. When asked what ONC is doing to overcome this challenge, he noted that they are using every tool at their disposal to increase sharing of information. In the meantime, ONC is working with industry to establish standards that would improve interoperability He said that ONC’s 2014 certification standards for Electronic Health Records represent a step forward in solving these issues. But the stated intent of an agency doesn't always hold up over time, suggested Morgan Griffith (R-Va.). "In regard to the questions that--the list of examples that Waxman listed out, while the FDA does not currently have any plans, do you believe that the FDA could, if it so chose to do so, regulate those examples down the road if it had a change of heart?" Griffith inquired. Foreman allowed that the FDA, acting under its statutory authority in the Federal Food, Drug and Cosmetic Act, could, but that it would require compelling evidence of a health risk to do so. "We have no intent to," Foreman said. "The only thing that would change our mind is if there was a strong safety signal, that we became aware of a device that we were not regulating appropriately under enforcement discretion, but not regulating it. That would cause us to reconsider our position. But absent strong safety signals, no, we would not change our mind." Joseph M. Smith, M.D., Ph.D.
Steven Brill, Giovanni Colella, M.D., and Ezekiel Emanuel, M.D. Ph.D. examined how to lower the high price of healthcare at a recent Center for American Progress event, "The High Price of Health Care" on March 13, 2013. Steve Brill's widely cited Time cover story exposed a “uniquely American gold rush” for hospitals, pharmaceutical companies, and medical device makers at the expense of patients and payers. 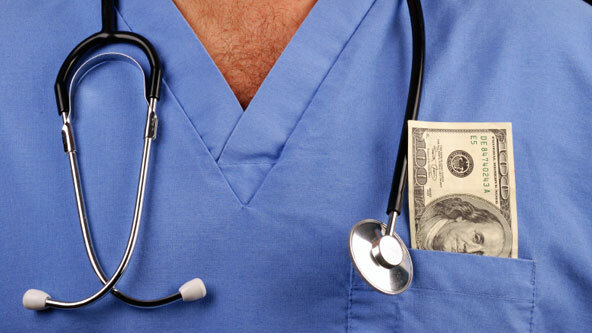 After analyzing healthcare bills and interviewing patients, hospital executives, and billing advocates, Brill found that patients and other healthcare purchasers are charged ridiculous prices, with markups as high as 10,000%. I agree that transparency in pricing and engaging patients are key to actually reducing healthcare costs. Leading experts in the field of healthcare joined the Center for American Progress to develop a plan to address the crisis of rising healthcare costs. The 11 cost-containment solutions were the subject of a New England Journal of Medicine article, authored by 23 prominent health care experts, including Dr. Ezekiel Emanuel, former administrator of the Centers for Medicare & Medicaid Services Dr. Donald Berwick, former director of the Office of Management and Budget Peter Orszag, and Center for American Progress President Neera Tanden. There was some interesting alignment between the NEJM article and Brill's piece. The Center for American Progress hosted this panel discussion with opening remarks by Tanden and moderated by Topher Spiro, Vice President of Health Policy at the Center for American Progress. The video below is from the event, the infographic below that was created by Maura Calsyn, Emily Oshima Lee, and Danny Schwaber. So first up and very exciting for me, early in the talk he came right out with praise for the work the HIMSS Healthcare Transformation Project is doing and the commitment from HIMSS to support this important work. He also showed gratitude for the partnership of Clinton Health Matters Initiative (CHMI) with Verizon and GE. He then went on to discuss how healthcare information technology can help with lowering costs and engaging patients. He drew an analogy between the success of relief efforts during the tsunami as well as the earthquake in Haiti, and how technology can be used in similar ways to not only improve healthcare quality, but also health access. Next he discussed how important systems are for success. Information and communications technologies and systems-engineering tools will be used to help realize vision of a patient-centered healthcare system. He said, "At some point in the life of every nation, almost every major system gets long in the tooth." He then went on to explain the critical importance of some of the changes which are necessary. He then later went in to some of the work being done by CHMI, as well as the Alliance for a Healthier Generation in combating obesity. Their agreement with the American Beverage Association has contributed to a 90% reduction in calories from beverages shipped to schools between the 2004-2010 school years, according to a report published in the American Journal of Public Health. The private market approach and the willingness of the business community to collaborate in the area of reducing obesity has had some stunning results. There was one hilarious moment where Mr. Clinton accidentally said "there has to be a way to sell drugs, ummmm, drinks in school and still make money." He then recovered nicely with "some people think sugar is a drug." In one of my favorite moments President Clinton stated how much he liked Blue Button. Blue Button epitomizes the idea that people should be able to access and download their own health information. He also spoke of the importance of price transparency. He cited Pennsylvania which every year publishes comparative data on health procedures, including how much they cost and the measurable results. There was a lot happening at the HIMSS conference this year, so keep your eye out for more posts on some interesting topics. At the closing session at the 2013 HIMSS conference, with James Carville and Karl Rove, they had a feisty debate on sequestration, immigration, politics, and healthcare reform; however, there was not mention of health IT. It started with some friendly banter and then quickly moved into some more heated discussion, particularly around lowering healthcare costs. 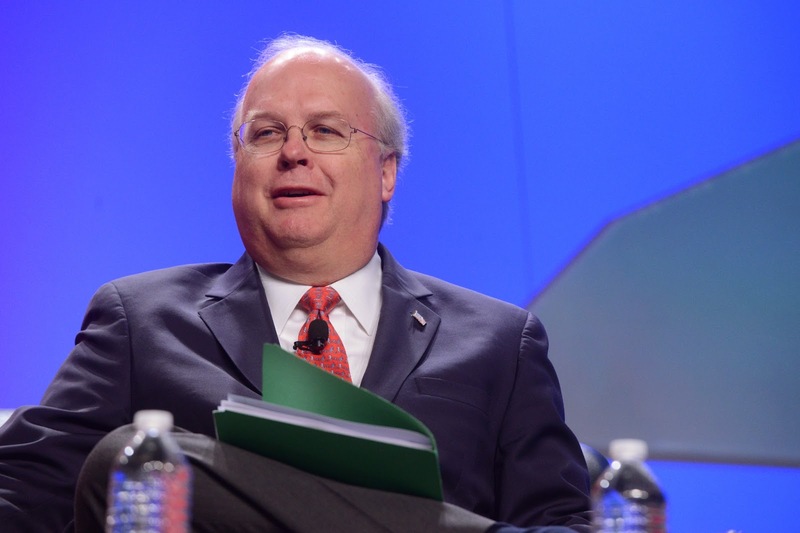 Rove called the ACA a "gigantic disaster, financially." 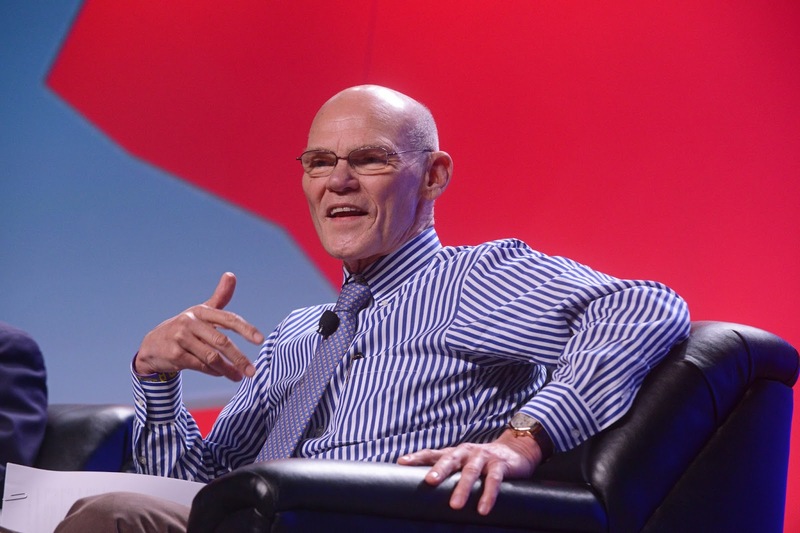 Carville supported the Obama administrations health reform efforts. I wish they had taken the debate to health IT, because I believe they may have found some common ground there. Last year HIMSS became a member of the Clinton Global Initiative (CGI) and committed to develop and implement the Healthcare Transformation Project (HTP). By fostering partnerships, providing strategic advice, and driving resources toward the adoption of the best uses of IT for health and healthcare, the HTP will address significant challenges in American healthcare. Through this project, HIMSS will harness the experiences and energy of early IT adopters to help recruit, activate, and convene a community of senior executive healthcare leaders who are well-positioned to develop and execute initiatives that realize the potential of IT to improve the way in which healthcare is delivered in the United States. Inspired by CGI, HIMSS will encourage participants to make commitments to their action plans. "Through the Healthcare Transformation Project, HIMSS has established its Commitment to Action as part of CGI. We know improving healthcare with the best use of IT takes a collaborative effort, one that senior executives can be part of through this HIMSS community," said H. Stephen Lieber, CAE, HIMSS President and CEO. In getting ready for the HIMSS 2013 conference I said that one of the most exciting things for me this year is HTP. HTP The is an invitation only initiative created exclusively for senior healthcare provider executives. This is an initiative intended to promote thought leadership and provide opportunities for an open exchange of ideas and networking for the entire leadership team, not just IT executives. As you can see from the agenda, the first day was pretty exciting. Unfortunately, Patrick Buchanan was not able to make it to HIMSS due to some surgery, but he was more than adequately replaced in the opening keynote by Mary Matalin in a very interesting and friendly joust with Donna Brazile. They discussed the current, and often dysfunctional, political environment and how this impacts the healthcare environment. Mary, is a conservative who served Presidents Ronald Reagan, George H. W. Bush and George W. Bush made some excellent points about free market reforms that could be undertaken. Donna, who is liberal, and a Democratic political strategist, an adjunct professor, author, syndicated columnist, television political commentator gave a very down to earth and hilarious . This was a perfect start to the day as we wrestled with how we can best use technology to transform our healthcare system in this politically charged environment. Next we had an excellent presentation from Robert Tagalicod the Director of the Office of E-Health Standards and Services at CMS, which among other things enforces the Transactions and Code Sets and National Identifiers (Employer and Provider identifiers) regulations of the Health Insurance Portability and Accountability Act (HIPAA). Most of the time I hear his testimony to the HIT Policy Committee on the EHR Incentive Program. At HTP he gave our community some insights into some organization structures within CMS and the kind of strategic thinking that is going on at CMS. He described how they are designing an architecture so that providers and other stakeholders have a single source of information on coordinating efforts toward implementing ICD-10, EHRs and meaningful use, operating standards, electronic quality measurement, and payment models. The Office of Enterprise Management serves as CMS' primary resource for expertise on project management and integration and oversees the Office of Information Products and Data Analytics, the Office of Enterprise Business, Office of Enterprise Performance, as well as the Office of E-Health Standards and Services. The hope is that he adoption of ICD-10, operating rules, and clinical standards will facilitate electronic data exchange and put information in the hands of patients and their caregivers in a way that has never been seen before. His presentation was thoughtful and engaging and led into some great discussion around the tables. We then moved into the workshop phase of the day which was facilitated by Kenneth R Jennings, PhD the Managing Partner at Third River Partners and author whose most recent book is 10,00 Horses: How Leaders Harness Raw Potential for Extraordinary Results.My hope is that with the incredible thought leadership around the room, we can move into some action leadership as the initiative moves forward. There was a great sense of shared purpose in the room and it will be very exciting to see the commitments to action that are undertaken. Then in the evening we relaxed at a wonderful cocktail reception and had a fabulous dinner with a keynote presentation from Jeb Bush, former Governor of the State of Florida and the brother of President George W. Bush. There has been a lot of speculation that he may be a candidate for President in 2016, and he just that day had come out with a new book Immigration Wars. He was very gracious, and allowed me to interview him, and then hung out with everyone for an hour before dinner. In his keynote he discussed economic policy, energy policy, touched on education and then dove into healthcare. He made some strong points that it would be good to give greater flexibility to the states on implementation of the Affordable Care Act. He did say that this is now the law of the land so we need to find solutions that fit within the framework of health reform. One area where he thought flexibility would help is the idea of having Mediciad and SCHIP plans offered on the health insurance exchanges. He reasoned that this would provide a broad base for a pool of healthy people to support the exchanges. He also said, "I am depending on health IT to help save the American healthcare system. 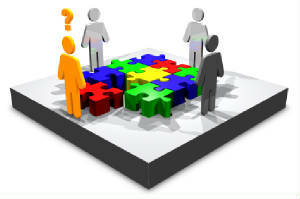 It is only by using technology to create a platform for innovation that many of these difficult problems can be solved." He then went on to say that open source software should be part of the solution. I seemed to be the only one who cheered this prospect but I was very happy that he saw the value. It was pretty incredible he was able to show such depth of insight and understanding of healthcare and information technology. I was very happy to finish the day as it began - with strong consensus that health It is an issue with bipartisan support. One of the very exciting things for me this year is the Healthcare Transformation Project (HTP). HTP The is an invitation only initiative created exclusively for senior healthcare provider executives. This is an initiative intended to promote thought leadership and provide opportunities for an open exchange of ideas and networking for the entire leadership team, not just IT executives. There will be robust discussion between the health IT and the non-IT professionals about how best to use IT to transform healthcare. Through roundtable discussions, educations sessions, and networking events we will develop actionable plans that will result in real results in our local communities. HIMSS has become a member of the Clinton Global Initiative (CGI) and HTP is the HIMSS commitment to action as part of CGI. In fact, HTP is implementing CGI's "Commitment to Action" model, and senior healthcare executives will have the opportunity to commit to taking actionable, measurable steps in their organizations that will make a real difference. This will transcend the HIMSS conference itself and be an ongoing initiative. We will document our commitments by specifying actionable, measurable steps they will take to make a transformative difference. Then from the semi-annual Virtual Conference & Exhibition to periodic conversational webinars, blogs and podcasts, we will have opportunities to gather knowledge and share stories with others in the HTP community throughout the year. At HTP participants will make these commitments that will translate goals into meaningful and measurable results in their own organization or community. HTP will serve as a forum for healthcare leaders to create and share their commitments to action, with the promise of transforming their organization and community. As you can imagine, I am pretty thrilled about participating in this and will be writing more on the topic as some of the projects bear fruit.